A native from Chicago, Leo Spizzirri is the founder and certified Master Instructor of the newly opened North American Culinary and Pizza Academy in Lisle, IL. He is a world pizza champion, dough specialist, and a partner and industry consultant with the Pizza Project Group. An artisan pizza and bread maker by trade, Spizzirri was certified as a pizzaiolo by 12 time world pizza champion Tony Gemignani at the International School of Pizza and completed his studies at the Scuola Italiana Pizzaioli in Venice, Italy under head master and world pizza champion Graziano Bertuzzo. 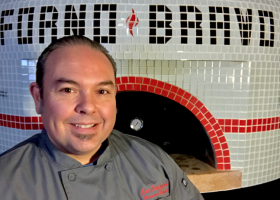 His work has been seen all over the world both as an international pizza competitor and as an instructor, where he is often treated as the authority in Chicago style pizza. He resides in Carol Stream, Illinois with his wife Melissa and their daughters Angelina, Isabella, and Giada.